zoozoozoo is not like the paper based picture book where you turn the pages, but is an interactive picture book where you follow the story by tapping, pulling, and rotating the screen. — Grizzly bear and the rabbit are best friends. But one day, the bear is nowhere to be found! To go on a quest to search for her beloved bear, the rabbit tries to find the key to open the mysterious door, and travels into many of her animal friends’ dreams. Will the rabbit ever find her best friend? Thank you for the Special Award. It has been 5 years since I started making apps. At first, there were many things that I didn’t know, but as a result of diligent work I was able to receive this award, and I am truly honored. ‘Animatope’ also won an award so I am very thankful! 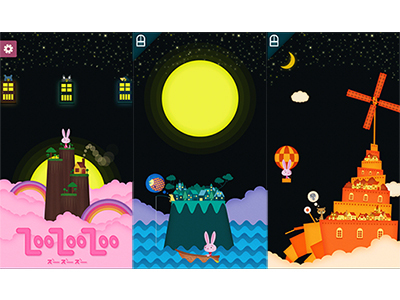 ‘zoozoozoo’ is a children’s Digital Ehon that adults can also enjoy. I will be happy if the app could further strengthen adult’s communication with children. Children are believed to build a closer relationship with the digital world in the future. To ensure that there will be no children with lower communication skills and creative mind as a result of this change, I hope that more and more outstanding works will be produced through this award.